The school board is comprised of five elected officials who develop and set policies for the district, which are then implemented by the Superintendent and the administrative team. School board members are elected for a four-year term of office. Public meetings are scheduled the second and fourth Tuesday of each month at the district office, 4665 Bernal Avenue, from 7:00 p.m. to 11:00 p.m. Meeting dates are listed on the Meetings/Agendas page. Meetings of the PUSD Board of Trustees that are televised live by Community Television TV 30 will be simultaneously webcast and may be viewed here (or on TV 28) using Adobe Flash Player. 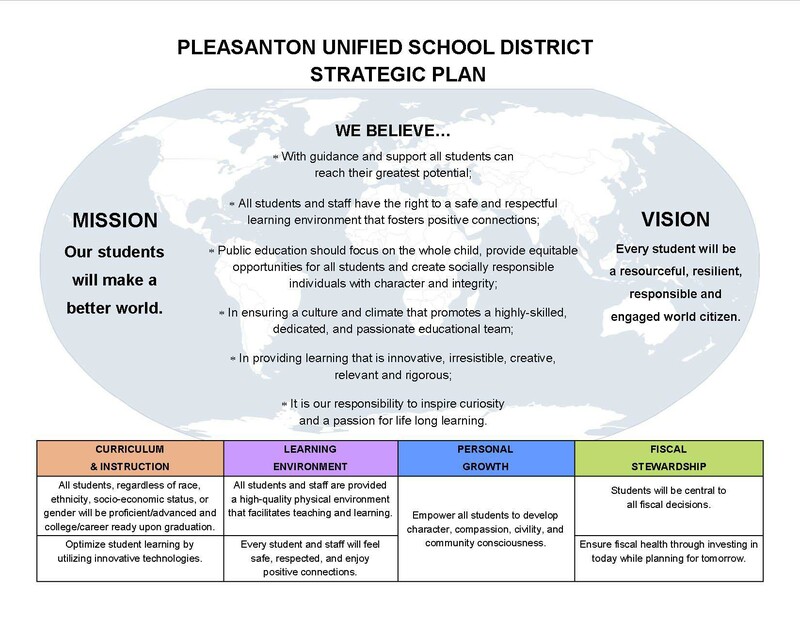 In coordination with the Superintendent and the Superintendent's Executive Cabinet, the Board of Trustees have adopted the PUSD Strategic Plan. This plan was created with the input of several hundred community stakeholders including students, parents, teachers, staff, City partners, and many more! On November 13, 2018 the Board of Trustees approved the revised Board Governance Handbook. Review the revised Handbook below.